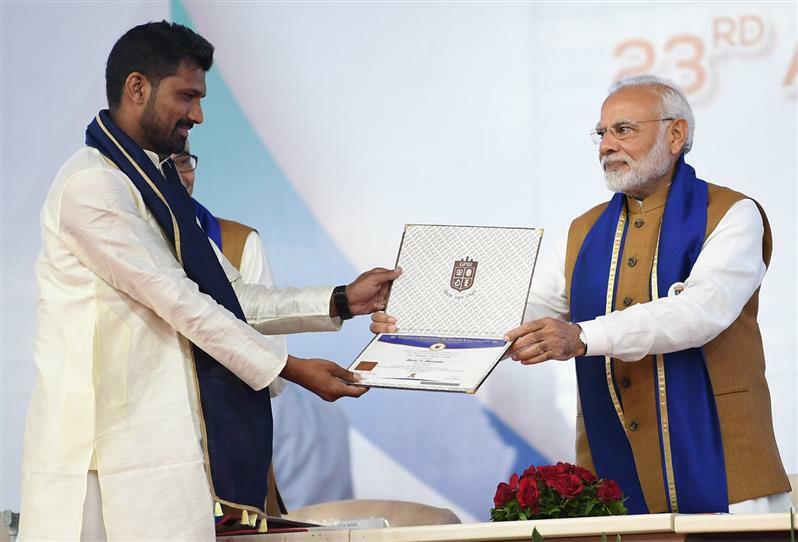 The Prime Minister, Shri Narendra Modi, today attended the convocation ceremony of the Gujarat Forensic Sciences University. He described the University and its students as pioneers. He appreciated the students for their persistence in selecting a stream that is conventionally believed to be unconventional, but is highly important for today’s age. He said that these traits of self-belief and determination will help the students in times to come. The Prime Minister said that a strong forensic science setup, helps in ensuring civic safety, and curbing crime, much the same way as an efficient police force and an effective judiciary. The Prime Minister said that it is important for a person to fear the possibility that he is very likely to be caught, if he commits a crime. This is where forensic science becomes important, the Prime Minister said. He complimented GFSU for creating an international human resource pool in the fields of criminal investigation and justice delivery. He said the Gujarat Forensic Sciences University is playing a decisive role in global security, through its training and education. 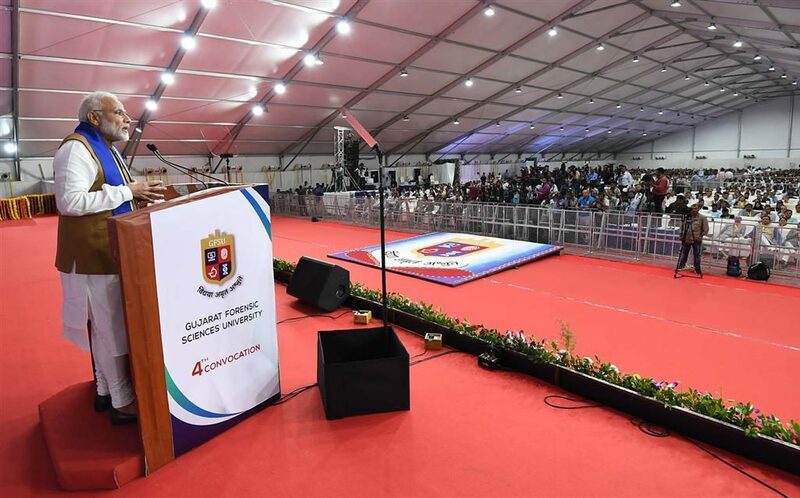 The Prime Minister spoke at length about the challenge of cyber crime, and the importance of strengthening forensics and cyber forensic labs in this context. He also mentioned the importance of forensic science in the insurance industry. He urged forensic experts to use DNA profiling to assist the judicial system, in bringing culprits to book. He expressed confidence that in the coming times, we will be able to deter heinous crimes, including the crimes committed on women. He called upon the students to be at the centre of changing trends across the globe. He exhorted them to drive some of the progressive changes that make our world a better place. He wished all the graduating students a bright and vibrant future. Criminals and ways of committing crime are constantly changing. Looking at the importance of DNA technology in forensic investigation, our government has approved the DNA Technology (Use and Application) Regulation Bill 2018. Swami Vivekananda used to say each soul is potentially divine. Each one of us has tremendous strength that is waiting to be explored. The first step towards manifesting this strength is to believe. Your education and intelligence has trained you to think out of the box. but also to drive progressive changes that make our world a better place. Urged students to keep pace with changing technological trends and be at the forefront of research and innovation that will make our world a better place.